It’s 7:55 a.m., and I can’t find the Facebook bus. On the corner of Cole and Haight, where it’s supposed to be picking me up, all I see is a Google bus. In that moment, before my morning coffee, it feels as if some kind of urban planning dam has been breached — the San Francisco version of the Lewis Black bit about seeing a Starbucks across the street from another Starbucks and realizing it’s the end of the universe. But it’s not. It’s a daily occurrence here, in the shadowy shuttle world of Silicon Valley. I’ve come to San Francisco to investigate the rise of these shuttles, which are used by tech companies to ferry thousands of their employees from the city to Silicon Valley and back. Google has them. Facebook has them. Apple, Genentech, and Electronic Arts have them. Every day, beginning at around 6 a.m., they pick up employees at dozens of stops around the city and deposit them an hour later on the manicured suburban campuses of their tech companies. At night, they reverse the route, with the last riders getting back to their city dwellings around midnight. Collectively, these buses represent a vast armada of plush, Wi-Fi-enabled chariots, delivering the precious brains of coders and other employees safely to their destinations without enmeshing them in the hassle of public transportation. I find the Facebook bus several minutes later — it’s idling across the street — and climb aboard. My host, a Facebooker who has kindly authorized me to ride with him on his Friday morning commute, explains that we should speak sotto voce unless we want to attract attention. The empty top level of a Facebook shuttle. Party buses these are not. 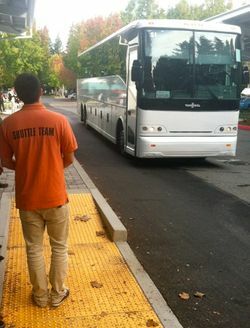 From interviews with a dozen or so shuttle commuters at various companies in Silicon Valley, I’d learned that most tech shuttles are noiseless, with employees checking their e-mail, pinning on Pinterest, or dozing on the ride to work. There are exceptions — one former Facebook employee used to break out cheap Champagne and plastic cups on the Friday after-work shuttle, and a couple of Googlers reported some “light PDA” between co-worker couples — but for the most part, placidity reigns. The Silicon Valley shuttle system began as an unofficial series of van rentals and car-pool arrangements between workers who lived in San Francisco and in the East Bay, but has recently blossomed into a full-fledged company fleet. Google says its buses — which cost upwards of $500,000 apiece — carry a combined 4,500 to 5,000 riders a day. Facebook says that between 40 and 47 percent of its employees use some form of alternative transportation, including six different shuttle routes, to get to work. Both companies employ transportation managers who use complicated tracking systems to figure out the best ways to hack traffic in real time and ensure that the shuttle-to-rider ratio stays optimized. 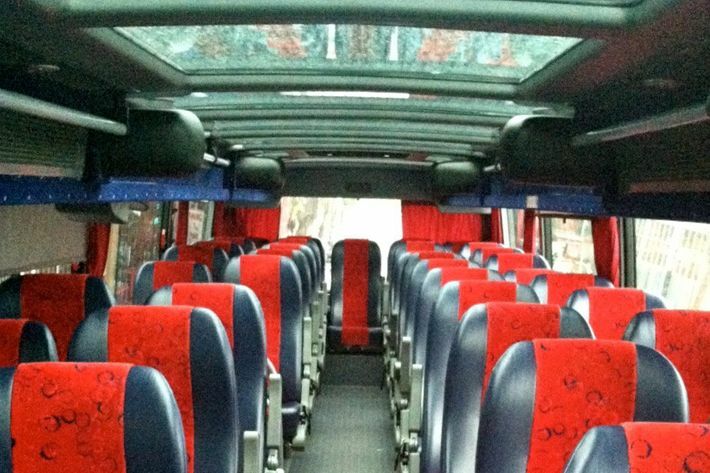 The shuttles themselves are plush but nondescript. 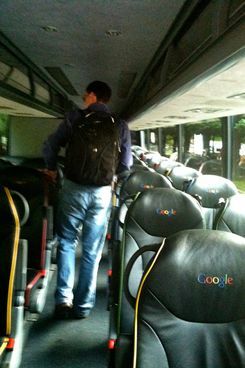 Google’s Van Hool buses have the company name stitched into every headrest, and Electronic Arts’ buses are wrapped with portraits of video-game characters. 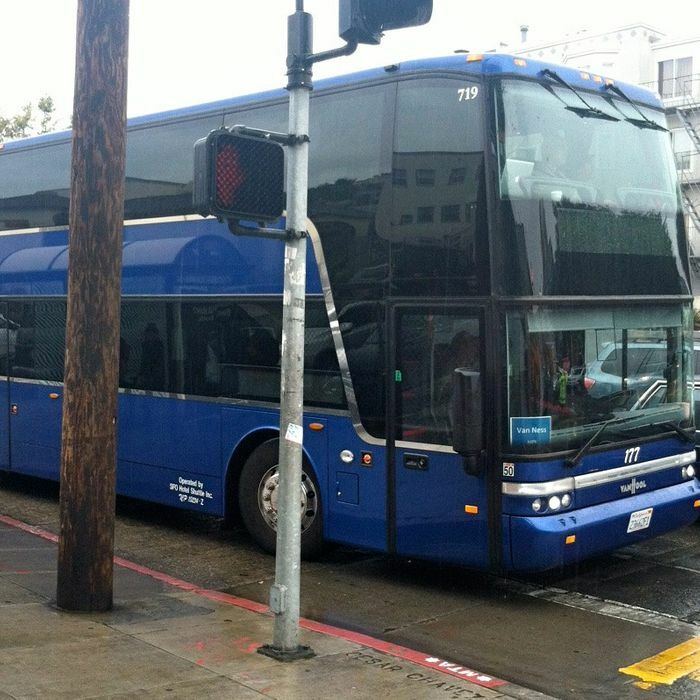 My Facebook shuttle, the one nicknamed “Big Blue,” was a double decker with a full-length sunroof on top and clean, new-looking seats. My host and I roll along quietly on our way to Menlo Park, passing stores like “Happy High Herbs” in the Haight and wall murals of Bob Marley on Valencia Street. A few more riders pile in at each stop — first two or three, then a small handful, then a dozen or so. The top level remains entirely empty, and the bottom level only reaches half capacity once we hit the Dolores Park stop, where a big group of sleepy-looking Facebookers piles on. 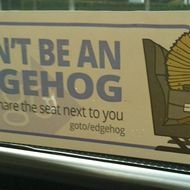 Sign on the Google shuttle. 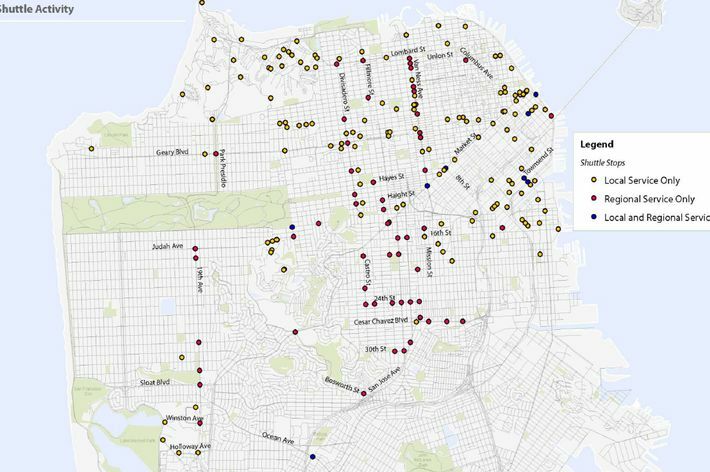 The prominence of shuttles has also amplified caste divisions, and magnified a culture clash between longtime San Francisco residents and the tech gentrifiers who have begun flooding into the city limits in recent years. In August, a Google bus driver was caught on film threatening a bystander who was taking a photo of the bus parked in a Muni lane, blocking the way for public buses and bicyclists. For many city residents, it looked like the self-centered tech ethos made manifest. Still, the private bus system carries substantial benefits. Large, fuel-efficient buses save untold carbon emissions, take thousands of cars off the road, and fill voids left by the relatively sparse Muni routes. Apartments near shuttle lines have seen their values rise, and more than one Silicon Valley worker told me that they’d picked a place to live based on an existing route. In fact, for many tech workers, the shuttles are the only thing that makes living in San Francisco possible. Brendon Harrington, Google’s director of transportation programs, talked up the green benefits of his work when we spoke. He touted Google’s biodiesel engines, solar-powered charging stations, and the thousands of tons of carbon emissions its shuttles save every year. 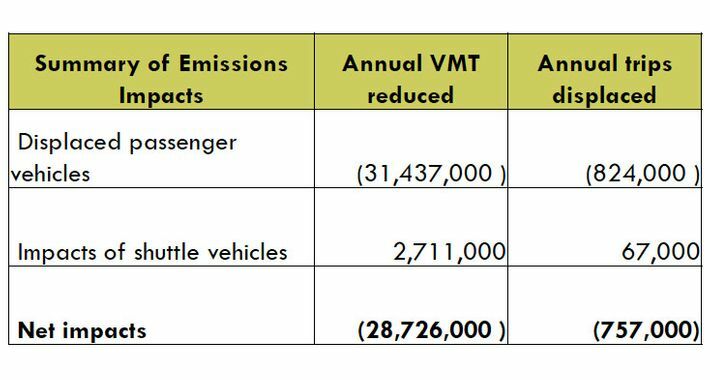 And indeed, the San Francisco County Transportation Authority, which made a presentation about the private shuttles in October, estimates that the shuttles save a net 28.7 million VMT (vehicle miles traveled) and replace roughly 757,000 single-passenger car trips. “It’s been enormously helpful, both from an environmental standpoint and in terms of getting people to work,” he said. The buses have non-environmental benefits, too — at Google, for example, employees can rent them on the weekends to shuttle friends to a party, say, or host an outing to Napa Valley. But for most employees, the biggest boon is having a clean, well-lighted place to work on the morning commute. During my Facebook ride, nothing of note happened. A programmer in a red plaid shirt edited a Wikipedia page on his laptop, while a bespectacled bearded guy nodded off across the aisle. The only noise, other than the clicking of keys, was the cheery “Good morning!” given by the bus driver, as each new passenger boarded. You might expect more from the rolling offices of tech companies, which are known for giving free massages and gourmet meals to employees at their headquarters. But when I asked my host if there were any hidden perks aboard the Facebook bus, he laughed.